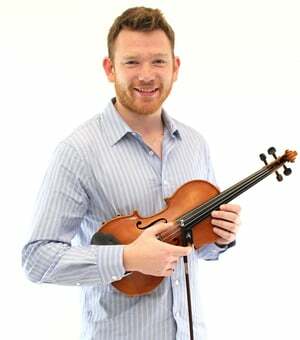 Hello, my name is Colm and I am the Violinist. I have been playing the violin since I was 4 years old and now play it full time professionally. I finished my Masters last year at the Royal Academy of Music and for the past year have been playing with an orchestra called Southbank Sinfonia, as well as the European Union Youth Orchestra. I enjoy all aspects of musical life (including practicing). I love playing in orchestras and being part of such a big ensemble, but also love chamber music and solo playing so I can show off a bit!As well as performing I love to teach. The violin can be learned by anyone, and I enjoy teaching people who themselves want to be professionals one day, and also those who just want to play for fun. One of the things I most enjoy is working with the National Children’s Orchestra’s, and seeing the future superstars of classical music develop.Outside of music, I am a huge rugby fan. I used to play lots but unfortunately it doesn’t mix very well with the violin! Best of luck with your musical adventures! What is your favourite piece: There are so many! Currently on the lists is Bruch's Scottish Fantasy, Tchaikovsky's Souvenir de Florence, and Mahlers 5th Symphony.